When I lived in Tampa, the local Florida Department of Transportation and its supporters would repeat over and over that bicyclists are causing their own deaths. That bicyclists are the ones to blame for getting killed on the deadliest roads in America. The DOT even paid some local hot-shot ad firm to create a campaign telling bicyclists to be fearful of the roads and that bicyclists were basically dopes for getting themselves killed. Then along comes the League of American Bicyclists -- the preeminent national bicycle advocacy group in the country -- with its own recent study of national bicyclist fatalities. Check out the League's post and report here. And lo and behold, the LAB concludes that motorists should be blamed for killing bicyclists. And the League also concludes there is shocking lack of pubic outrage and urgency in cities that have the highest bicyclist killings in the country (Re: Tampa/Hillsborough County). Here is one web site's summary of the LAB bicyclist death report. Everyone knows that the Summerlin section of Las Vegas is roadie heaven with all the wide roads and bike lanes, but even recumbent cyclists -- and recumbent TANDEM cyclists -- are out on the roads of Summerlin. These guys were at 215 and Far Hills Avenue, likely picking up the new 215 trail extension. Last year I reported that Interbike opened its B to B trade show in Las Vegas to the public on the final day by allowing bike shops to sell $50 passes to its best customers. Well, this year Interbike has decided to open the trade show to everyone on the final day in September for $20. Here's the Bicycle Retailer story on the show being open to consumers on the last day. Interbike's final day date is Sept. 12. Early light is wonderful at the Red Rock scenic loop. And on the other side of the road around Mile 2 you see this. Climbing the steep grade at Mile 4 is tough, but it's made easier thanks to the lovely roadside scenery. Finally, at the overlook, it's time to savor the views. Top is 4,771 feet, according to the park, though my altimeter says 4,805. This morning I was debating whether to take State Road 159 through Red Rock Canyon to Blue Diamond or veer off onto the Red Rock Scenic Loop for some serious elevation gain to 4,771 feet. Turned out that I made the wise decision to hit the Scenic Loop because I got to meet this 70-year-old, fella, Bob, a retired health care worker from Saugerties, NY, 90 miles north of New York City. I saw Bob's 2003 New York five-boro bike ride jersey, so I figured he was from around metro NY. When we began chatting, he said he was from a small village 90 miles north of New York City. I said Saugerties and Bob seemed mildly surprised that I identified it since it is a small village in north Ulster County, both on the Hudson River and a gateway town to the mighty Catskills. Bob was pedaling a Cannondale R300, which is an aluminum road bicycle that is about 20 years old. He had a granny front ring and a cleated shoe to churn out the tough miles from two to five as we chatted and pedaled up the steep grade. His wife was on their son's old road bicycle, a Centurian, I believe. We chatted away about the Hudson River, Saugerties and the Catskills. Bob is an avid hiker and a member of the 3,500-foot hiking club of the Catskills. He and and his wife are driving across the country via Nashville. He's staying in Summerlin so that a daughter from Phoenix can visit. Have fun Bob and good strategy to get up so early to bike and beat the famed Vegas heat. When it's late May and it's three-digit-temp time in the Las Vegas Valley, it's time to seek cool refuge at 8,000 feet and Mount Charleston, where the temps are in the pleasant 78-80-degree range. The evergreen aroma is amazing, bringing me back to biking Trail Ridge Road in Rocky Mountain National Park. On Monday, to contemplate why our country is so beautiful and so violent at the same time, I biked the Lee Canyon Rd. and Kyle Canyon Rd. areas near the top at 8,000 feet, including the nine-mile, high-elevation road that connect the two. I prefer Lee Canyon near the Meadows and ski lodge area. The pass road connecting both canyon roads is an amazing ride, though it's much harder going from Kyle to Lee Canyon Road. This perspective is looking south toward Kyle Canyon Road. Let's get into the mind of a motorist who intensely dislikes bicyclists. So, I take off from my apartment at 6 a.m. and the weather is unreal -- gorgeous with no winds with temps in the 70-degree range. As I head for the sacred Red Rock Canyon this Saturday, some friends couldn't join me so I pedal by myself and quickly realize that the Las Vegas bicycling community has also discovered this amazing lush weather, which is ideal for cycling this morning. On State Road 159, the main road that serves as the path to Red Rock mecca, it looks like there's an organized ride when in fact in just waves and waves of cyclists making the weekly Saturday morning pilgrimage. There's a whole bevy of different bike clubs, riding cliques and plain old groups of biking buddies on the road. Here's the Red Burros. Generally speaking, there are many bike groups like the speedy Burros and the blue-and-green kit bike club. Then, there's the Las Vegas Valley Bike Club and the Lisa Caterbone bike club, which is great for newbie roadies who want a mellow and safe cycling experience. The local Summerlin/Spring Valley bike shops like Las Vegas Cyclery, McGhie's, Broken Spoke and Peloton Sports have their followings. And then, there's the Lifetime hardbody roadies out of Summerlin. I love to stop and take photos and go at my own pace, which usually varies, so I'm not a good candidate for these rides because everyone goes at the same speed and don't stop for quirky stuff that often draws my attention. This morning, I gave special attention to the quasi-butte-like formation on the south side of State Road 159 and often feel bad that its more famous neighbor on the north side -- Red Rock Loop area -- gets all the pub. So, here's to you, pseudo-looking-butte formation. And here's a short video of our friendly quasi-butte. On the way home, I stopped and took some photos of datura doing its thing along SR 159. There were several plants, but I enjoyed this one the most. How Did Bicyclists Become Second-Class Citizens After Creating The First Paved Roads? Back in the day, bicyclists are the ones who got roads paved in this country. So why do most car drivers want us off the road? To understand how bicyclists went from creating the first paved to roads in the U.S. to becoming second-class road citizens on the road, please read this amazing history lesson. One of the best things about bicycling to work is that you can actually meet people when you're commuting -- unlike being a solitary figure in a single-occupant car stuck in traffic. On the ride in this morning, I met this friendly fella -- a guy named Andrew pedaling his fixie about 15 miles to meet a pal off Charleston Blvd. in Las Vegas. I'm for paved trails as much as the nice guy -- but not when the trail is simply a sidewalk. Like this section of Bonanza Trail in Las Vegas. When you bike east and are heading in this direction, you're pedaling on a sidewalk in front of a convenience store entrance/exit. Exiting drivers turning right won't see you and might broadside a bicyclist passing in front. Most of Bonanza Trail is a typical paved trail. But using sidewalks around busy roads and intersections to connect pieces of Bonanza Trail could be dangerous. This afternoon I hooked up with bicycle pal Kevin Cannon for a short ride in the center of Las Vegas' western suburbs, where we patched together a mix-and-match route of roads with bike lanes and official trails such as the Bonanza Trail. There's a huge emphasis in the bicycle world of training bicyclists to ride on roads and be safe with motorized vehicles -- and that's great. But the fact is most families and inexperienced and new bicyclists will not want to venture onto a roadway, which is why cities and counties need to build networks of paved off-road trails so that little kids and their parents can bike and even encourage new bicyclists to learn some basic skills. Above is Kevin heading to the hardware store to get some home supplies during this afternoon's bike ride. Todd duBoef is an executive. He's president of a boxing promotion company you may have heard about -- Top Rank. DuBoef is also part of a growing trend -- executives who ride bicycles on roads and on off-road trails to blow off steam, meditate, de-compress, socialize or even do the occasion business deal. DuBoef rides his road bike in the Summerlin area and his mountain bike on trails in the Colorado Rockies and around Leadville, which is more than 10,000 feet above sea level. If you look at the best and most forward-thinking businesses, it's the ones that encourage their workers to bike to work, have shower facilities, provide changing rooms with lockers and have executives who like to bike. Some of the world's best bike racers are a mere four hours away from Las Vegas by car in southern California this weekend for the Amgen Tour of California. The Anschutz Entertainment Group (AEG) -- the folks partnering with MGM Resorts Intl on the new $375M arena on the Strip -- created the Amgen Tour of California and runs this multi-stage pro race. Unfortunately, one racer is going to remember this race because he began celebrating with one lap to go. Listen as The TV announcers are bummed for the dude. The TV broadcasters are so proper and polite: "One lap to go my friend. That is a shame." Today's episode of Two Yentas on a Bike takes us to the lovely and hilly scenic loop road at Red Rock Conservation Area, where Scott and I chatted like a pair of old ladies at the mahjong table. As usual, we gabbed about everything from politics and religion to family and running marathons in our youths. The first five miles on the loop are mostly uphill, including several S-turns, and as usual we chit-chatted our way up the steep grade. When we reached the overlook parking lot just before Mile 5, a woman who passed us shortly before the top quipped to us, "You two are still talking? I wish I had a bike partner to talk with while I was biking." We gabbed some more during a short break, then raced down from the top spot at 4,771 feet above sea level to State Road 159 and back to Summerlin. One of my favorite points along the loop is around Mile 10 when The Big Stripe -- the one you see from miles away -- comes into close view. On Saturday's ride, after finishing the Loop I stopped at the State Road 159 overlook where several bikers were congregating -- including this fella. He's a Summerlin guy who just moved from LA. Los Angeles has come a long way as a bicycle town. I'm on assignment in LA for a few days, so early this morning it was fun to roam downtown before some interviews and check out the growing bicycle scene in Los Angeles. It's Bike to Work Day here, and the Metro public transit system helped put on some bike commuting pit stops, including this one where I met a nice fella name Andrew Craig who works for a non-profit called Climate Action Reserve. Moments before I snapped a shot of Andrew in action on his bike. I also saw bike lockers and also a cool sign on the back of a Metro bus. 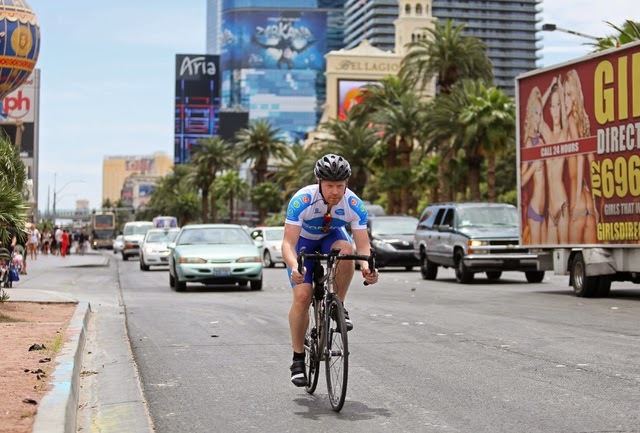 The cities of Las Vegas and Henderson have struck bronze -- as in being a Bicycle Friendly Community at the bronze level as awarded by the League of American Bicyclists. It's a big deal for a city to be recognized; and Henderson has stepped up with its bike trails; bike events such as the recent ciclovia and swap meet; and its police bike patrol. Meanwhile, Las Vegas increased its bike network by more than 23 percent to 444 miles of bike lanes and 102 miles of paved off-road trails. It also installed bike parking racks throughout downtown. 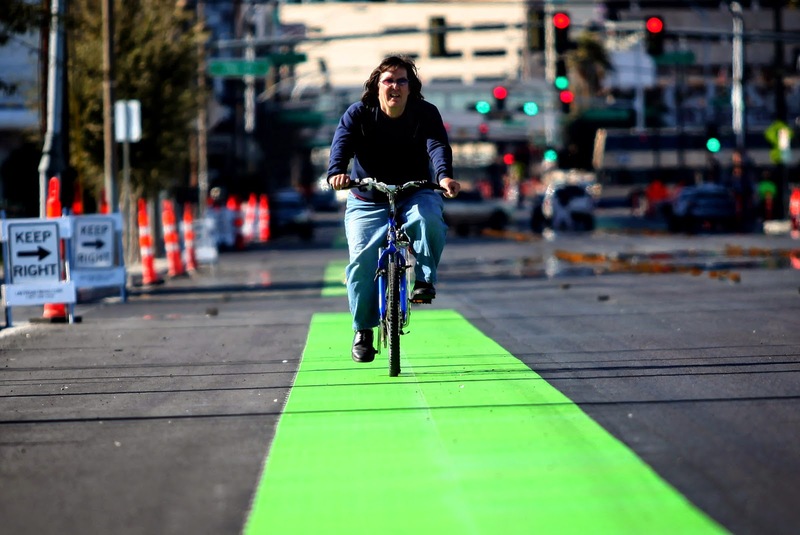 Congrats to Henderson and Las Vegas for being Bicycle Friendly Communities, entering at the bronze level. My 12-mile bicycle commute celebrates a good day and improves a bad day. When I head to work, I bike a mile on a flat trail to a street called Alta Drive, which drops 10 miles or about 1,000 feet to the edge of Las Vegas' downtown. That's right, one road and 10 miles straight as an arrow. Then, it's another mile to the office. It's all downhill to work. Steady winds out of the east pushed me up Alta Drive and for a second time ever, I got home in seconds less than an hour. I rarely look at speed and time as key qualities for my bicycling. That's why it's such a novelty and a kick in the head when I do. More than anything else, bicyclists detest wind. For me, I'd rather bike in severe heat or cold or rain before I bike into sustained headwinds of 40 miles per hour or get pushed into traffic by crosswinds of those speed. Yes, we are the two mashuganas of 159. After surviving the ride out to the Scenic Loop entrance, Scott and I grinded up the first mile on the Loop, battling tenacious headwinds while pedaling a grand total of 3 miles per hour. We hit the first parking lot, and Scott was ambitious to say he liked to continue biking to the second Red Rock loop parking area about a mile away. But here's the deal: at this point on the Loop, there was ZERO land buffer against sustained winds of 30-40 mph out of the north/northwest. Here's a video of Scott heading out to the second lot. Scott biked about 100 yards and the wind was tossing him around like he was a butterfly. So he turned around and we decided the best thing was to reverse field (we had biked only a mile) and advise the Red Rock Loop toll people to tell bicyclists to not dare the winds. The wind nearly toppled Scott over. Here's Scott coming back. When we turned around and raced down the hill back to the entrance, it was like we were shot out of a canyon -- ha, just a little literary joke there folks. We bicycled back to the last shopping center on 159 and decided to bike the new six-mile 215 trail extension north of Charleston Boulevard. Looked like there was some traffic control on the trail between Cheyenne and Alexander. Well, we were the only crazies on bicycles even on the trail. Sometimes, it's just not a good idea to challenge Mother Nature on Mother's Day. 1. The cyclists who scream, "left,!" when passing me startle me more than if they simply pedaled past me. 2. The fast guys in the fancy matching bike shorts and jerseys don't say hi. 3. Why do so many bicyclists have music buds in their ears? First off, it's super unsafe not to hear all forms of traffic around you. Second, why shut out the world around you when biking? I bike to embrace that world. 4. It's a rare morning when there is not a car in sight at the overlook on the Red Rock Loop. Just three bicyclists. 5. I couldn't help but laugh when the Red Rock toll guy checking passes and taking money told me, "I know you. You don't have to whip it out. Go ahead." While I was out at lunch in downtown Las Vegas Thursday, I saw this very cool bike parking spot, designated with the green bike lane paint. Very cool story by David Ferrera at the RJ on a guy who uses a bicycle to detect cyber security problems in Las Vegas. This TV news report has been getting quite a bit of pub. The reporter is chatting about the wet weather in Pensacola in Florida's western panhandle and the guy in the tall bike is pedaling away above the mini-road river. For the whole TV report, you can check it out here. 1. This is sad news for bicyclists. Former Congressman Jim Oberstar from Minnesota, who for more than two decades brought millions of dollars from Washington, DC to bike projects around the country, has died. He was 79 when he passed away from unknown causes in Maryland. One of my personal highlights was hanging with Congressman Oberstar during the National Bicycle Summit in DC a few years ago. A Tea Party candidate defeated Jim in Nov. 2010, but I will never forget Jim stoking the political juices of bicyclists at previous bike summits. This is a major loss for the bicycle world. Bicycle Retailer and Industry News (BRAIN), the bicycle industry's trade magazine, did a story on Jim and what he meant to the bicycle industry. 2. Arnold Knightly, who covers the city of Henderson for the Review-Journal, did a story on Henderson bringing back its police bike unit. 3. Well, May is Bicycle Month and we will be seeing a month's worth of bicycle stories. I think bicycle awareness should be 12 months a year, but California Highway Patrol says use caution for bicyclists in the month of May. Shouldn't bicycle awareness be a 12-month, year-round effort? 4. People for Bikes is a wonderful national bicycle advocacy organization in Boulder run by Tim Blumenthal. Cities always complain there isn't money for bicycle projects, but Peopleforbikes.org offers a community grant program -- so check it out. 5. One of my favorite bicycle initiatives in Tampa Bay was launching a restaurant bicycle tour called the Hub Grub Ride in Tampa's Seminole Heights, which inspired several other restaurant tours including one put on by the Trek Store in St. Petersburg, which is owned by Rick and Anne Fidanzato. 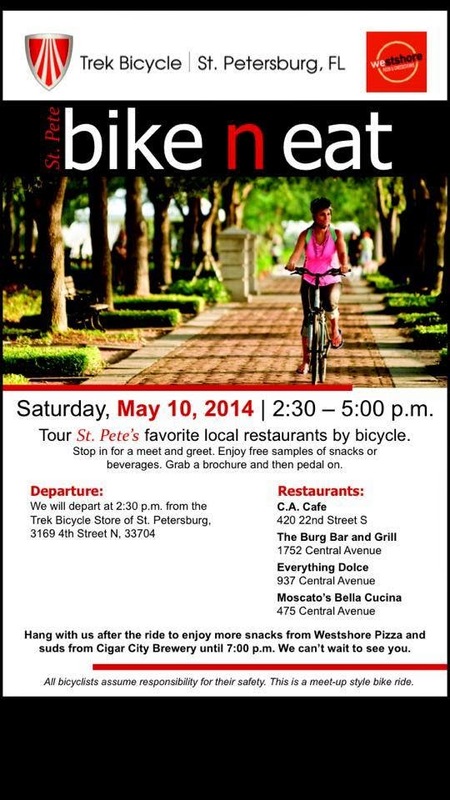 They are putting on the annual St Pete Bike n' Eat bike tour on Saturday. This morning I met my Summerlin friend Scott for a ride up to and around the Scenic Loop and back to Summerlin. Scott has become my alter ego and we can gab away the hours like two yentas as we climb the hills leading to the overlook summit of 4,771 feet on the Scenic Loop. Scott and I share similar cycling style and speeds, making for an ideal conversationalist on wheels. While we chatted grinding out the miles heading up the high desert, we biked like hell down the slopes, hitting 42 mph thanks to severe winds out of the southwest. Above is Scott biking on the Scenic Loop just after Mile 6 as we ascend The Wall after some screaming downhill runs. One of the great things of living in Summerlin and so close to the gateway to Red Rock is that every organized bicycle ride sets up shop at the technical high school parking lot at Charleston Blvd. and Sahara. Such was the case today as the Tour de Cure had a major pit stop, where it was a lot of fun to see all the varied bicyclists -- and volunteers in Cinco de Maya fiesta headgear. The Red Rock Scenic Loop is one of the Las Vegas treasures. If this was Colorado or California, the Loop would be packed with cyclists. But the Las Vegas bicycle scene is still growing, which means the Loop is usually a calm place to ride a bicycle. The climb to the top turn-off is always a challenge. Thank goodness I have a new bike to help power me there. The elevation is impressive, especially for a guy who biked a lot in Florida. Altimeter says 4,710 feet above sea level. Not too shabby. Around Mile 10 on the 13-mile loop The Big Stripe comes into view.